Jame Mosque (meaning Friday Mosque) or Jame Complex is a collection of buildings in over 12 centuries and has been in UNESCO world Heritage list since 2012. 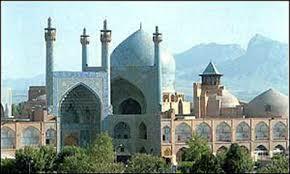 The Jame Mosque has been constructed, reconstructed and renovated several times during Buyids‘, Seljuqs‘ Era ,Mongols‘, Muzzafarids‘ Era and Safavid Era. The Jame Mosque has been mostly constructed during the Seljuqs‘ dynasty. The renovations and additions have continued until Safavid dynasty. The northern iwan with Kufic inscriptions and simple brick pillars was built by the Seljuqs‘. Taj-al-Molk Dom is located behind this iwan. The southern iwan, included works from the Mongols‘, 15th century and Nezam-al-Molk Dom is located behind it. The western iwan is built by the Seljuqs‘ and decorated by the Safavids‘. Next to the western iwan, is Sultan Uljeitu‘s Mihrab. This Mihrab is, decorated by Quranic inscriptions and floral designs. With more than 20,000 sq Meters, the Jame Mosque is the biggest mosque in Iran. It is also the oldest Friday mosque in Iran. The Jame Mosque in Isfahan is an outstanding example of Iran‘s architectural adaptation and technology and is being used as place to worship.